Active Release Technique® is a patented, state-of-the-art soft tissue mobilization protocol that has proven to be so effective for such a wide range of injuries that it is now considered the leading soft tissue therapy in the world. SOL’s founder, Dr. Tammara Moore, DPT, was the vey first physical therapist in the US to be certified in Active Release Techniques (ART). She has traveled the world as a senior ART practitioner and teacher and our SOL Physical Therapists are exceptionally skilled in their effective use of this treatment. Active Release Techniques® (ART) is an advanced form of non-invasive, soft tissue mobilization that specifically targets scar tissue (also called adhesions) that accompany soft-tissue injuries. Scar tissue limits the normal range of motion of joints and muscles because it causes abnormal binding between muscle groups, and can become very tough and inflexible compared to healthy tissue. The more that scar tissue forms, the more joints or tendons become strained and nerves become entrapped. Scarring, adhesions and trapped nerves in the soft tissue of the body often lead to pain, weakness, immobility, and generalized dysfunction – all of which are addressed through the use of the specialized ART® approach. Muscles are composed of tiny filaments of tissue that run parallel to one another, allowing each muscle to move freely. When a muscle is injured, these filaments tear. Some muscle tissue injuries are sudden like tears and sprain/strains. Others are the result of “cumulative trauma” like carpal tunnel syndrome, tendinitis, and bursitis. Regardless of the cause, the body reacts to the injury in a similar way, by filling the damaged area with inferior tissue known as fibrous adhesions. Adhesions can develop between muscles or within muscles. Still, the result is the same—the once parallel filaments of muscle tissue get bound together so they no longer slide and glide freely, impairing movement and causing pain. The goal of ART is to disperse dense scar tissue, release fascial restrictions and increase range of motion by restoring normal mobility and “glide” between muscular tissue and nerves. It can also help push joint fluid throughout the body and stimulate the lymphatic system to decrease inflammation. Each ART session is different and custom-created to treat the patient’s problem depending on the location and severity of the symptoms. SOL’s highly-trained ART practitioners evaluate each patient’s condition, locate areas tissue damage, and then treat the underlying cause of the injury by employing a combination of pressure, tension, and over 500 specific movements that require a thorough understanding of anatomy and movement by the practitioner, as well as a sensitivity of touch that is only gained through experience. 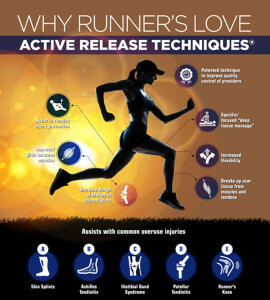 Active Release Technique® is a safe and conservative approach to scar tissue, which is addressed by external manipulation of adhesions within your muscles. To achieve the benefits associated with ART®, manual pressure on the skin and underlying tissues will be felt. This pressure can be uncomfortable at times, especially within the first couple of sessions. As adhesions are released, a temporary duplication of the pain associated with your injury may be experienced. When this occurs, this is evidence that the correct issue has been identified b your ART® provider, and that a positive outcome is on its way. 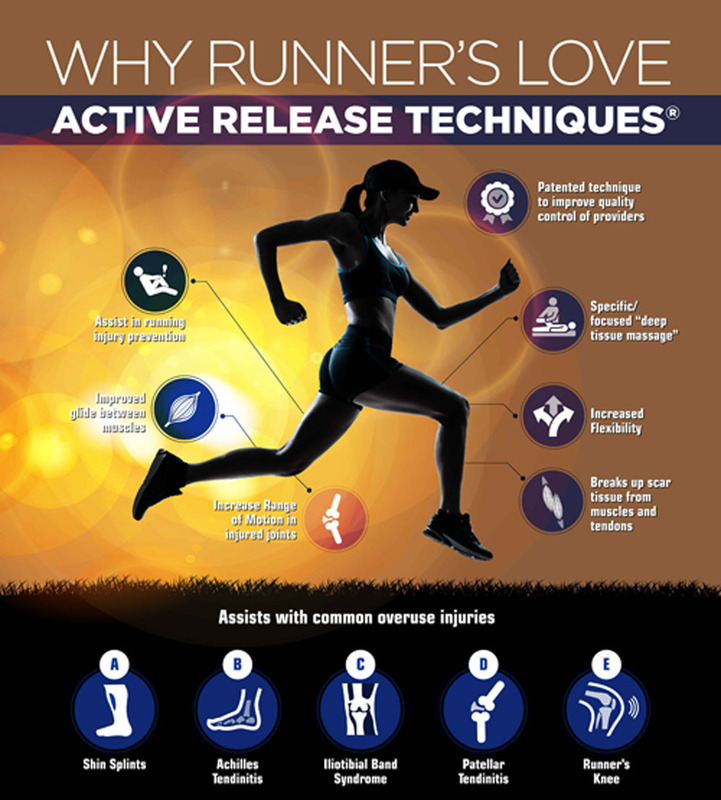 Can Active Release Technique® help me to perform better? You bet! One of the core benefits of ART® is its ability to help improve your performance by optimizing the function of your muscular system. By reducing the adhesions and restrictions in your muscular tissue, your body will be able to move more efficiently, generating more speed and power than is possible when muscular adhesions are intact. We have our center in Oakland, CA. Common Conditions :Lower back Pain; Shin Splints; Plantar Fascittis; Tension Headaches; Carpal Tunnel Syndrome; Shoulder Strains; Frozen Shoulder; Bursitis; Tennis/Golfers Elbow; Sciatic Nerve pain/Sciatica; and much more. Book an Active Release appointment today! Get yourself on the schedule. Start feeling the incredible effects of SOL’s Active Release Techniques program today.